New research published today projects a doubling of surface melting of Antarctic ice shelves by 2050 and that by 2100 melting may surpass intensities associated with ice shelf collapse, if greenhouse gas emissions from fossil fuel consumption continue at the present rate. Ice shelves are the floating extensions of the continent’s massive land-based ice sheets. While the melting or breakup of floating ice shelves does not directly raise sea level, ice shelves do have a “door stop” effect: They slow the flow of ice from glaciers and ice sheets into the ocean, where it melts and raises sea levels. 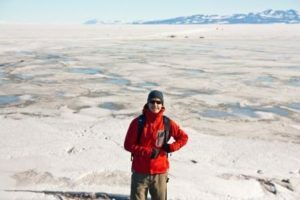 Luke Trusel, postdoctoral scholar at Woods Hole Oceanographic Institution, stands near sea ice covered in melt ponds at McMurdo Station in Antarctica, in 2010. 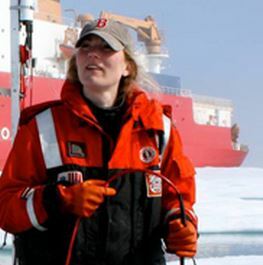 Trusel received a Ph.D. in geography at Clark University in 2014. The study published in Nature Geoscience is titled “Divergent trajectories of Antarctic surface melt under two twenty-first-century climate scenarios” and was conducted by Trusel (Ph.D. ’14), Clark University Associate Professor of Geography Karen Frey, WHOI scientists Sarah Das and Kristopher Karnauskas, Peter Kuipers Munneke and Michiel R. van den Broeke of the Institute for Marine and Atmospheric Research Utrecht University, and Erik van Meijgaard of the Royal Netherlands Meteorological Institute. To study how melting evolves over time and to predict future ice sheet melting along the entire Antarctic coastline, the scientists combined satellite observations of ice surface melting with climate model simulations under scenarios of intermediate and high levels of greenhouse gas emissions until the year 2100. The results indicate a strong potential for the doubling of Antarctica-wide ice sheet surface melting by 2050, under either emissions scenario. However, between 2050 and 2100, the models reveal a significant divergence between the two scenarios. Under the high-emissions climate scenario, by 2100 ice sheet surface melting approaches or exceeds intensities associated with ice shelf collapse in the past. Under the reduced-emissions scenario, there is relatively little increase in ice sheet melting after the doubling in 2050. “The data presented in this study clearly show that climate policy, and therefore the trajectory of greenhouse gas emissions over the coming century, have an enormous control over the future fate of surface melting of Antarctic ice shelves, which we must consider when assessing their long-term stability and potential indirect contributions to sea level rise,” said Frey. Funding for the research was provided by NASA, the Doherty Postdoctoral Scholarship Program at WHOI, the Netherlands Earth System Science Centre, the Polar Program of the Netherlands Organization of Scientific Research, and the Dutch Ministry of Infrastructure and the Environment.